Is nuclear the safest and most cost-effective path forward? (Whitby-Oshawa): Are there safer and cheaper ways to meet our energy needs than rebuilding outdated nuclear plants? Why hasn’t the government even considered alternatives like large-scale energy efficiency and importing clean water power from Quebec? No nuclear project has delivered on time or on budget in Ontario’s history. 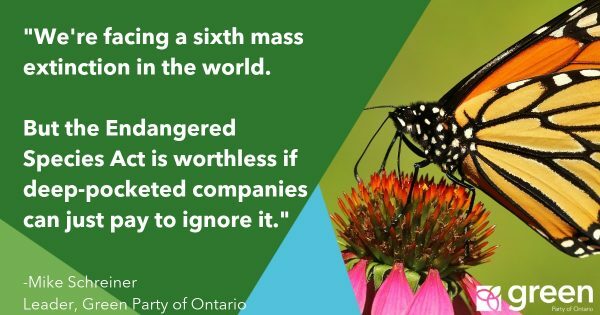 Yet the Liberal government has refused to conduct an independent, public review of costs and alternatives before committing billions to rebuild old nuclear plants. The GPO asked Ontarians to support their call for an independent, public review of how much nuclear will cost, and how it compares to alternatives – and to date 2275 Ontarians have signed their names in support. Schreiner in an open letter to the Minister is calling on the government to stop work on rebuilding nuclear plants in Ontario, until a full, independent and public review is completed.